From religious paintings to calligraphy, psychedelic art, elaborate drawings to portraits of politicians, truck art has come a long way in the country. The truckers of India, consider their vehicle as a kaleidoscope that shows off quotes, colours, and detailed painted symbols with extreme bang and the bling. Truck art across the world may now be a renowned art type but to the Indian driver, it means so much more than a locomotive artwork. It reflects his character and is a brilliant advertising strategy for new customers. Largely a domestic art in its early years especially in North India and Pakistan, the ideation of beautifying trucks, lorries, and rickshaws with multifaceted patterns and calligraphy was common. It has developed radiantly and innovatively now. During 1970s the local truck art became popular to the developed world. It was the European and American travellers who clicked glimpses of profoundly decorated trucks and buses. It’s rather interesting to note that the trucks formed the second home to his drivers in country with a leg on each side of 4 million square kilometres approximately. While they hit the highways, transporting cargo to rural parts of India which are unapproachable through railway they were also away from family for long durations. These vehicles thereby got transmogrified into moving houses, complete with makeshift couches and photo frames of family and dear ones living at a distance. During the 40s a more reserved aspect of the truck art was represented in the subcontinent. Sikh transporters, who drew their spiritual gurus or people who helped flourishing the Sikh community were primarily noticed on trucks and Lorries. The visuals were executed with vibrant and sharp colours. Concurrently, Muslim truckers started painting renowned Sufi saints on their vehicles. They began adding more and more creative subjects around their portraits, like beautiful scenery, flying horses etc. The art then moved to the mainstream arty elements like, pop and densely coloured backgrounds, with pictures of deities and gods, Hindustani film celebrities, and political symbols that describe much about the trucker handling the steering. The overly decorated trucks are also referred to as ‘dulhans’ by the truckers. It would be safe to say that Truck Art is considered to be an old traditional art in India – vibrant paints, patterns, fancy quotes and some distinct poems – They carry you to a cultural excursion and a journey reflecting diverse belief of India. The truck art isn’t just about aesthetics it reflects some deep-rooted religious sentiments and cultural viewpoints truckers and people related to the transport industry. 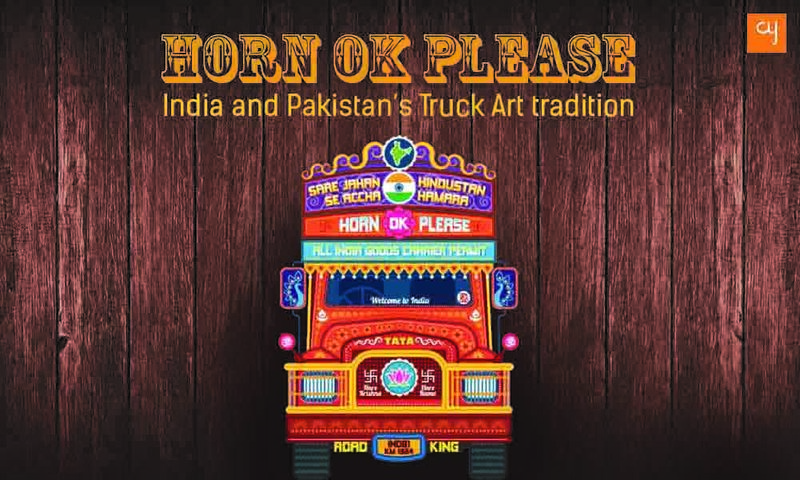 Words like “Horn Ok Please” inscribed across the back of the truck is a message to other drivers to hoot their truck horns while overtaking on a busy route; It has now turned into a perennial custom on Indian highways.